I love learning about artists, their lives, and what inspired their work. Each month or so, I’ll pick an artist whose birthday is coming up, and I’ll write about the Interweave products that remind me of the artist’s work. I hope I can entertain and inspire you, as well as instill some knowledge along the way! Let’s embark on this art history bead journey. Check out last month’s artist, Salvador Dalí, to get all caught up with what we’ve learned so far! This month’s artist is M.C. Escher, Dutch graphic artist born on June 17, 1898. To celebrate Escher’s birthday, all of the patterns featured in this article are on sale! 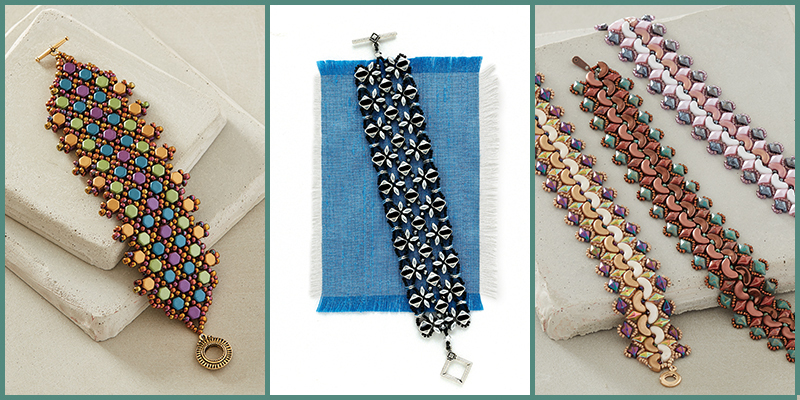 Use beads to create an optical illusion with one of these projects from Beadwork magazine. M.C. Escher is best known for his optical illusions and impossible architecture, such as stairs that seem to lead to nowhere. The mathematical nature of bead weaving makes it easy to relate to the geometry and dimensionality of M.C. Escher’s art. The Loomed Illusion bracelet by Susan Pelligra is a great example of how you can weave optical illusions with patterns of beads! If you want to make some jewelry inspired by math and geometry but you like a little more structure, Sue A. Neel’s Swinging Chevrons Earrings have a geometric stair-step design that is on-trend and playful. If you used black and white beads, these earrings would fit right in with M.C. Escher’s lithograph, Relativity. Nichole Starman’s Atrium Bangle is an architectural puzzle for the eyes. The winding layers of beadwork keep your eye traveling around, like the never-ending staircase in Escher’s Ascending and Descending print. M.C. Escher loved tessellations, which are a common aesthetic in bead weaving. Photo by ToniFlap /Getty Images. A sailing tour of the Mediterranean and the Moorish architecture and mosaic decorations of Spain provided Escher with endless inspiration. Tessellations like the mosaic tiles at Alhambra pictured above became an obsession for him and he created tessellated designs for the rest of his life. 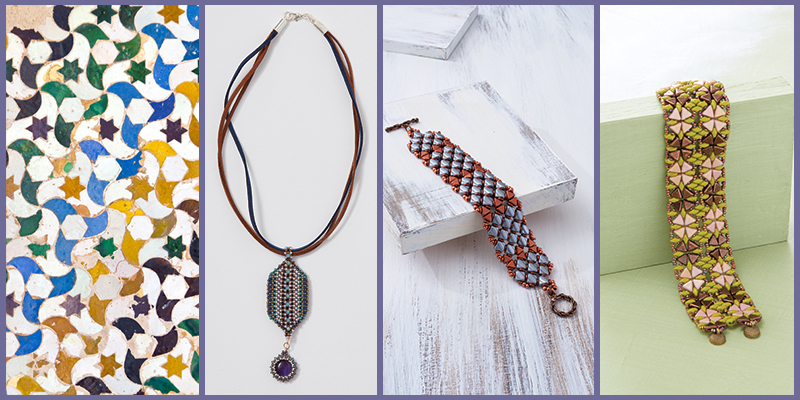 Cindy Kinerson’s Striped Mosaic Pendant interlocks beads into a beautiful, colorful puzzle. Color, pattern, and geometry come together in the Modern Patchwork Bracelet by Marina Montagut to remind me of the red terracotta roofs in Escher’s Metamorphosis ii, a 13 foot long print of morphing tessellations. There are so many shaped beads to play with, and Svetlana Chernitsky pieced together a beautiful tessellation using two-hole SuperDuos and Khéops par Puca triangles in her Clover Cuff. Reflections and mirror images are prevalent in M.C. Escher’s work and these beaded bracelets. Playing with perception and using reflections are important to M.C. Escher’s work. Many of his pieces include mirrors, reversing patterns, and layers of designs. Symmetry is not a hard thing to find in any beadwork project, but the colors you choose and the design of the piece can play up the symmetry. The mirror pattern of honeycomb beads in Shanna Steele’s Mirror Image Bracelet is an explosion of color and symmetry. If you don’t like bold colors, but you love geometric symmetry, create the Metropolitan Nights Bracelet by Laura Graham. The sparkling crystals and shiny silver beads contrasted with jet black are bold but elegant. Shae Wilhite’s Copper Reflections Bracelet has a shifted-symmetry design reminiscent of light refraction in water. Escher’s work features a lot of light-refracting surfaces such as water and glass, as in his Magic Mirror and Three Worlds prints. You can draw a lot of inspiration from the winding puzzles, tessellated designs, and symmetry of M.C. Escher’s work. 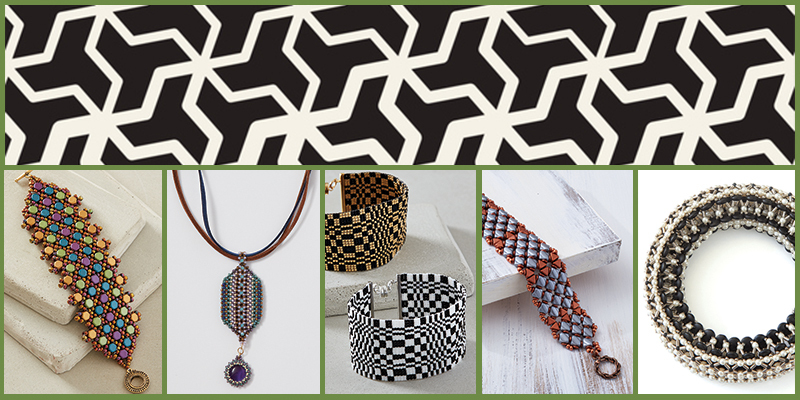 Try one of these patterns or get out your beads and stitch together your own Escher-inspired piece! Stay tuned for our next installation of Beading with the Masters and learn about Alphonse Mucha! 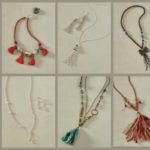 Read the entire series of Beading with the Masters here! Featured Image: Optical Illusions, Tessellations, and Reflections are common themes in these beaded projects and M.C. Escher’s artwork. Photo by Samolevsky/Getty Images. 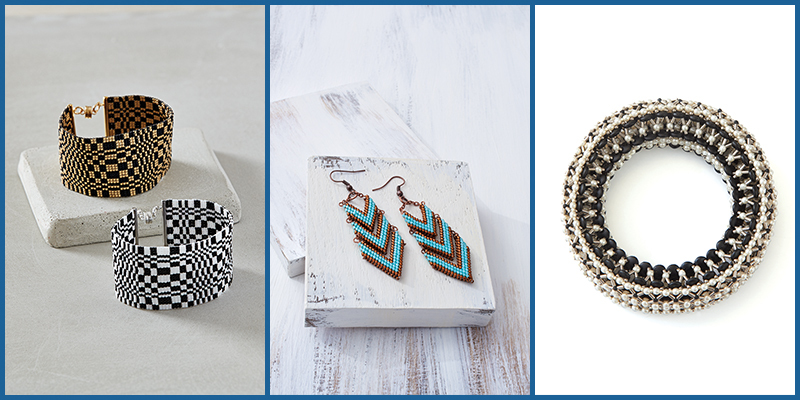 Discover new resources at Interweave! You’re very welcome, Yvette! I love writing this series. Have you checked out the other articles? (there’s a link to the series in the last part of the text) — next month you’ll get to hear about Alphonse Mucha, the quintessential Art Nouveau painter and graphic artist. I’m excited!